Arkham House, 1985; 260 pp. ; limited to 3,544 copies. First Edition. 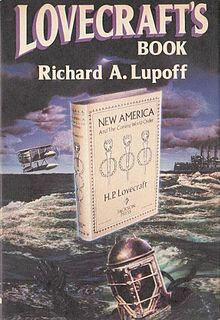 Lovecraft's Book is a historical novel by author Richard A. Lupoff. It was the author's first book published by Arkham House. The story concerns an offer made to H. P. Lovecraft by a fascist sympathizer, George Sylvester Viereck. His offer is to have Lovecraft write a political tract in the nature of an American Mein Kampf. In return, Viereck promises the publication of a volume of Lovecraft's stories.